If the day after your cleaning you notice any drops or marks, just give us a call and we will be happy to return in 2 days time to re clean whatever you like free of charge! 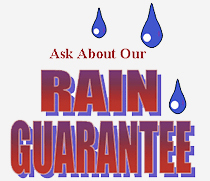 It is our policy to complete a scheduled job if it is raining. In the event of light precipitation we will continue as scheduled because rain does not affect the cleaning. In the event of heavy rain or showers, we will return within 1 to 2 days to complete the outside work. The interior of all windows are completed as scheduled so there is no disruption to your schedule. Dirt makes your windows dirty not rain. The dust from landscapers, tree pollen, exhaust, and many other sources settles on your windows. Rain drops move the dirt around your windows and after the rain dries the dirt remains on the glass. This residue is now very visible because it’s been spread over the window. Clean windows remain clean after the rain because once the water dries there is nothing left behind to obscure your view.